In the last several weeks since the start of May, we had too much rainfall (>15 inches in many areas) during crop planting. I have received several inquiries regarding herbicide damage on cotton and peanut, mostly related to Reflex, Valor and Dual Magnum. I have summarized these questions below. 1. I have a pigweed problem and I use Reflex behind the planter. However, it rained over 5 inches since I planted and my cotton seedlings is showing bad Reflex burn on cotyledons. What should I do? Should I replant? The answer is check your crop stand first. If you do not have enough stand, then a replant is definitely needed. If the stand is acceptable and seedling burn is the only issue, wait to see if these seedlings will start to put on first true leaves (see Picture 1). As long as they start growing, it will be a matter of time for them to recover and usually no visible injury can be seen on true leaves. Varieties with high seed vigor (e.g. Phytogen 444) may get a better stand and grow out of initial injury sooner. Picture 1. Reflex injured cotton is showing good regrowth and adding true leaves. 2. Will I lose yield because of soil herbicide injury caused by excessive rainfall? No significant cotton and peanut yield reduction caused by soil herbicides has been observed in my research trials in the last two years, if these herbicides are sprayed within label rates. Herbicide injured cotton and peanut can usually grow out of initial injury and stunting in 3-4 weeks under normal growing conditions. However, if these crops suffer further stress such as prolong water-logging, thrips, snails, rhizoctonia, fusarium and other pests, yield loss may be possible. Therefore, managing other pests and stress will be important to secure yield. 3. Can Valor sprayed behind planter hurt my peanut if it rained too much? In our Valor trial this year, I have observed some stand reduction in Valor 3 oz/A and Valor 3 oz + Strongarm 0.45 oz/A plots that were caused by excessive rainfall as compared to non-treated checks. But nothing makes me very concerned and this stand reduction did not happen often in our trials. The Headland trial showed a little more stand reduction than Fairhope trial. One thing I have to mention specifically is if you plant old seed or low quality, low vigor peanut seeds, you may see Valor injury more often because those seeds may barely get you an acceptable stand even though you do not spray anything behind the planter. Seed quality and vigor are very important to overcome initial herbicide injury and stunting. 4. With this much of rain lately, should I still spray soil herbicides in my cotton and peanut? The answer is definitely yes. 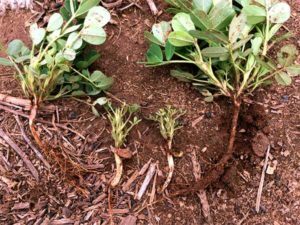 In a very dry year, most weeds do not grow fast and it is easy to get them after the rain with a POST herbicide application because they usually make a flush after rainfall. But in a wet year, they will grow whenever it does not rain and they will grow fast in warm temperatures. In the meantime, farmers cannot get into those wet fields and they can only watch weeds grow if there is no herbicide residue in soil to slow weeds down. Therefore, using soil residual herbicides such as Dual Magnum, Warrant or Outlook are very beneficial to control weeds in a wet season. In my on-farm demonstration this season at Bay Minette, some soil herbicide treatments are still holding back pigweeds even after 3 weeks and 10+ inch rain!!! 5. I sprayed Dual Magnum behind planter on my peanut. Will this be a problem? Possibly. Dual Magnum has decent water solubility and capability to move in soil. If too much rainfall occurred after planting, peanut seedling could easily pick up Dual Magnum in soil moisture and show J hook root symptom (see Picture 2). Cotton seedlings can be stunted by Dual Magnum as well. Therefore, Dual Magnum should not be used as PRE in peanut and cotton. It can be tank mixed with most of the POST herbicides in peanut such as Gramoxone, Ultra Blazer, Storm, Cobra, 2,4-DB, Cadre, etc. 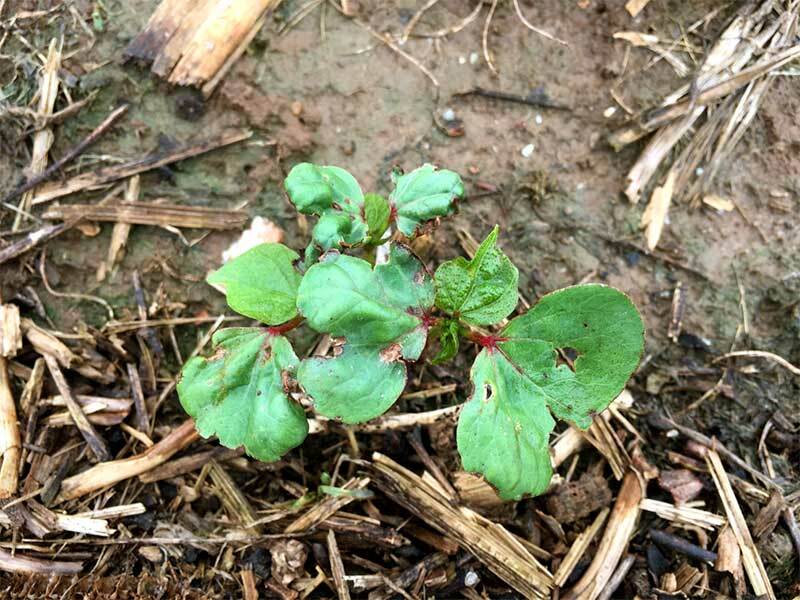 In cotton, Liberty + Dual Magnum has provided consistent weed control, particularly glyphosate and ALS-resistant pigweed, in my trials at multiple locations in the state. Make sure cotton is at least in 1 leaf stage so they can handle Dual Magnum over top. Photo 2. peanut J hook root symptom caused by Dual Magnum PRE. 6. Why did I see worse Reflex injury on heavy soils compared to sandy soils? In sandy soils, Reflex can easily move further down in soil profile with rainfall. So, its concentration at soil surface is reduced as compared to in a heavier soil which does not drain well and adsorb more Reflex than sandy soils. Also, cotton seedling needs to push heavier soil harder to make a stand and soil temperature of heavy soil is usually lower than sandy soil. So, cotton seedlings have longer time to get exposed to more Reflex in top soil before emergence. These factors all contribute to worse Reflex injury on heavy soil than sandy soils. If intensive rainfall is expected, Warrant, Prowl H2O, Direx or Cotoran may be safer than Reflex on these heavy soils. 7. I have to replant because of bad crop stand. Do I need to spray soil herbicides again? Will that be too much of residues for my crop to handle? A difficult question to answer. My suggestion is to scout the field carefully and find out if there are many small weeds germinating in field. If so, that means soil herbicides applied have largely dissipated and another application is needed after planting. If very few weeds can be found and field looks mostly clean, burn down the remaining crop and weeds with Gramoxone + Prowl H2O and start clean. .
Cotton and peanut have very good tolerance to Prowl H2O and other yellow herbicides, these residual herbicides will ensure weeds will not overrun crops at the starting line. POST1 application needs to be applied timely in these replanted crops when weeds are below 6 inches tall. Better early than late!!! 8. Do I still need to spray Dual Magnum, Warrant or Outlook on top of cotton seedlings injured by soil herbicides? These seedlings also have thrips damage. Probably not for POST1. A timely application of Liberty or Roundup (if you do not have resistant pigweed) will hold back the weeds and buy your crop some time to grow back. But I do not think weeds will be held back very long before they grow back. If no residual herbicide is used in POST1, a foreseeable outcome is POST2 needs to go out early, and a residual herbicide such as Dual Magnum, Warrant or Outlook is definitely needed in POST2. In peanut, do not use Gramoxone on weak stand, soil herbicide stunted, or thrips damaged crop. 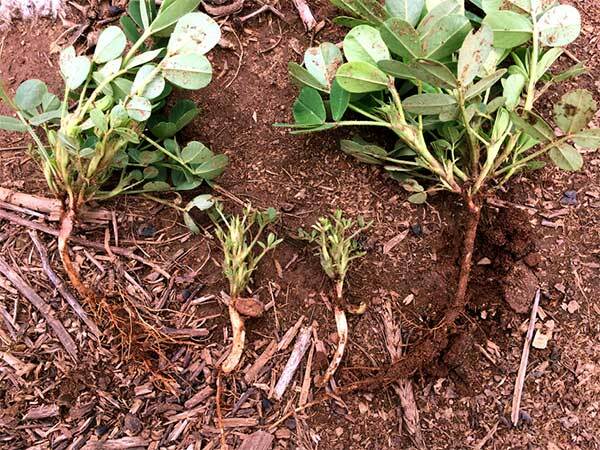 Gramoxone burn will worsen the conditions of crop and may cause yield loss. Use Cadre, Storm and 2,4-DB instead of Gramoxone to tank mix with residual herbicides. Zidua is a new peanut residual herbicides with similar mode of action compared to Dual Magnum, Warrant and Outlook. Alabama trials have shown that Zidua caused very little peanut foliage burn (less than 10%) or no visible injury when spray over the top of seedlings at 1.5 oz/A rate. This is another promising option to be tank mixed with POST herbicides in peanut.